did it work? i want to see myth busters try it! From my experience, it must not have been either a King Cobra or a Krait. I might be wrong but I can't remember anyone I heard of surviving one of their bites. Probably not a King Cobra anyway since most of the time they kill other snakes including cobras and eat them. 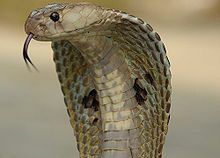 Anyway, ain't enough beer in India to make me want to bite a cobra of any kind. The Honey Badger has already proven this to be true. Honey Badger don't care.